Noodles is a universally liked dish I guess!! Haven't met anyone who was against noodles. When such a liked dish is converted into a dessert, I am sure it can only get exciting!!! Boil 2 cups of water with 1 tsp of oil. Remove from flame and drop in the noodles into it and keep the vessel closed for 10 mins. Drain the water and run the noodles under cold water, keep it aside. Take oil in a pan and fry the cooked noodles little by little until it turns light brown and crispy. Collect them on kitchen tissue to drain excess oil. Take the sugar in a pan and add 2 tsp of water. Heat this until the sugar melts and turns light brown. Remove from flame and add honey to it and mix well. 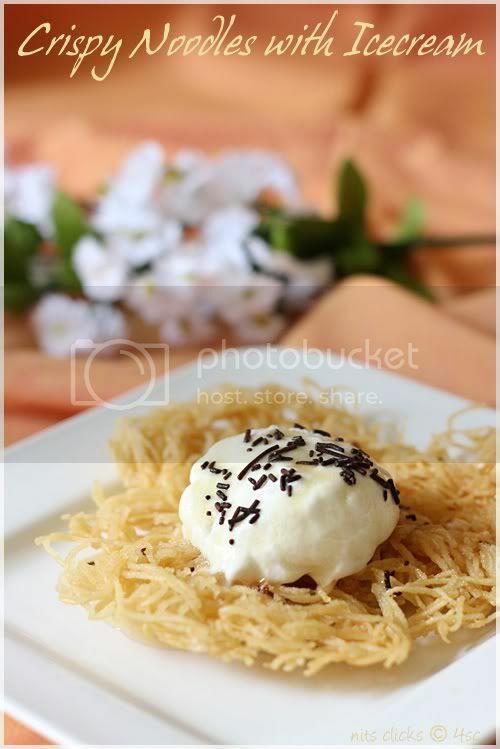 Serve some crispy fried noodles on the serving plate and top it with a scoop of vanilla ice cream. Now pour the sugar honey syrup on top of it and serve immediately. 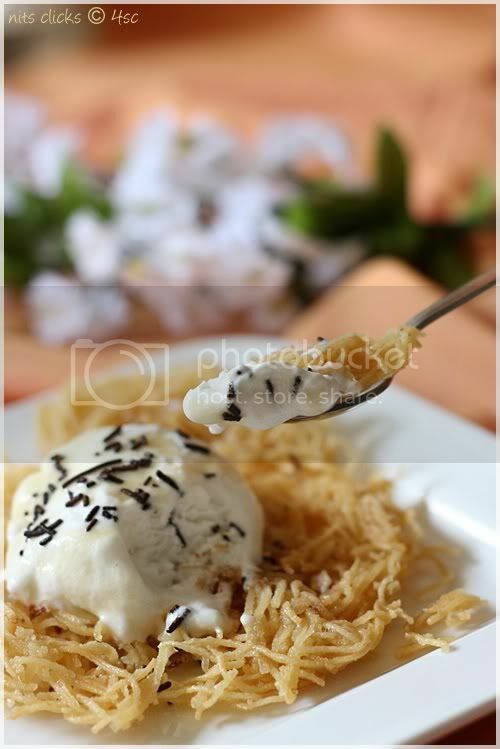 Excellent combination of ice cream and noodles. Looks super tempting. Wow!!! Looks Yummy! !Wl def try it out!!! Thank u for sharing!!! That looks so yummy......must try!! Looks excellent and inviting..Cant wait to try soon.. Tempting my sweet tooth ha. Nits, how do you come up with such delish new recipes every week!?? Amazing! Looks good! I ate something like this before, but didn't think it could be something I could make. Your recipe seems easy to follow. Thanks for sharing! Had this sometime back but never knew how it was made.Thanks for sharing. 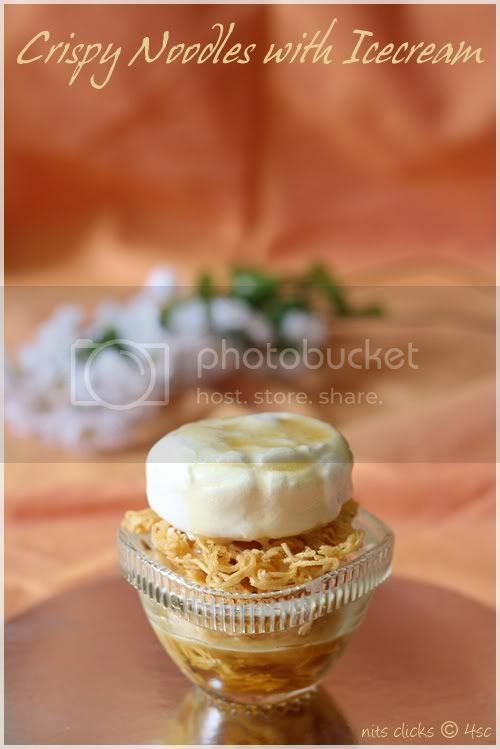 Beautiful dessert and beautiful click... dessert looks very tempting. 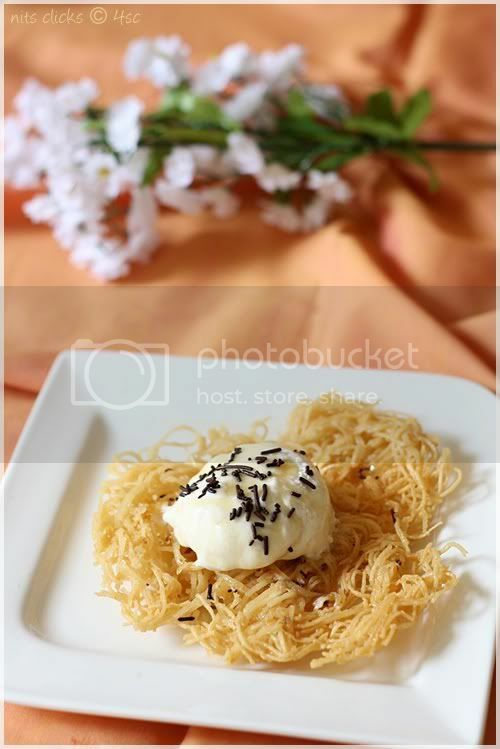 wow am drooling dear....very nice presentation and very creative and innovative recipe...luv the clicks a lot! A perfect dessert and its so easy to make too. lovely pics tempting me dear. what a wonderful idea! looks superb! would have tasted divine! something different. must have been an interesting combination of texture and flavour.